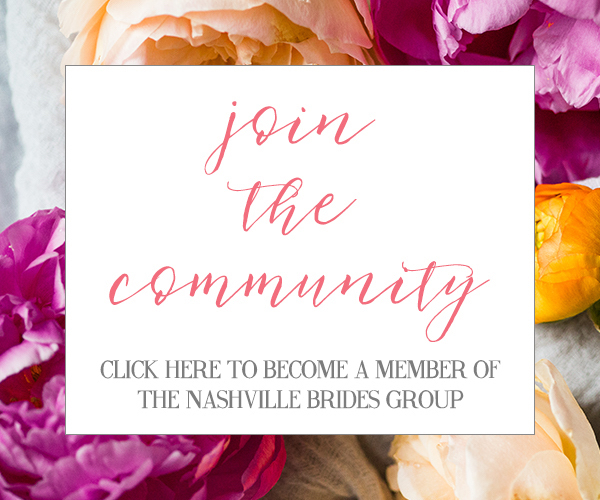 It all started with an idea... the royal wedding happened earlier this spring and I really wanted to design a styled shoot with my Nashville Bride Guide vendors centered around this theme. 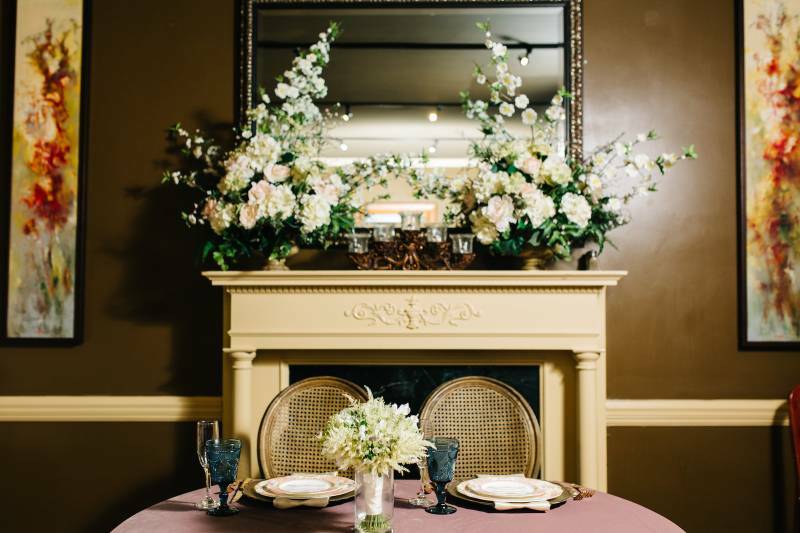 However, it would be an elopement styled shoot! 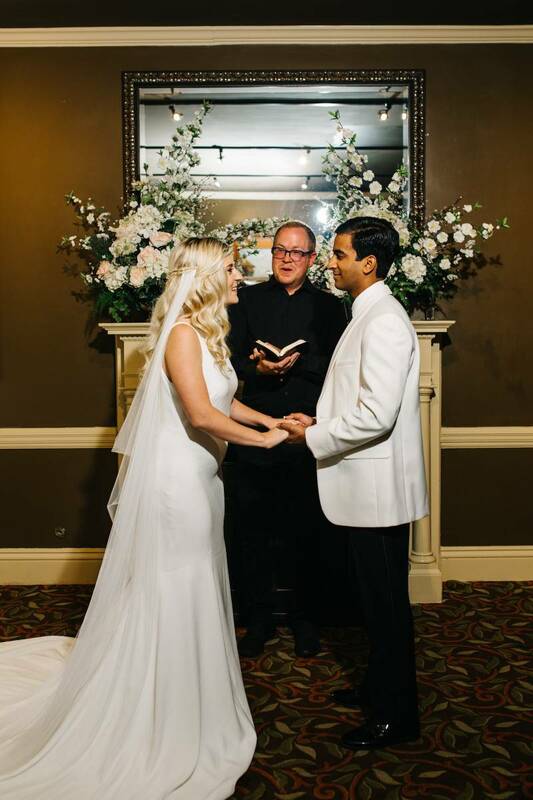 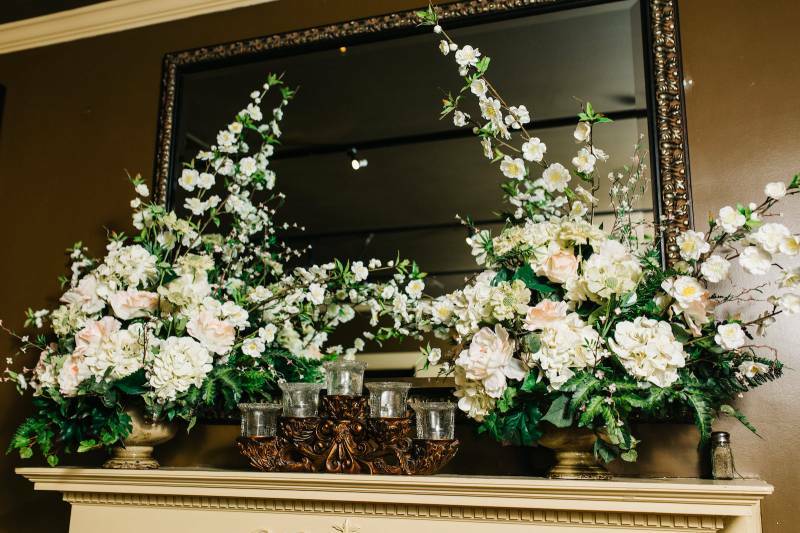 With the help of an incredible team of wedding pros, we were able to create a traditional scene with elegant elements sprinkled in with a few wow-factors. 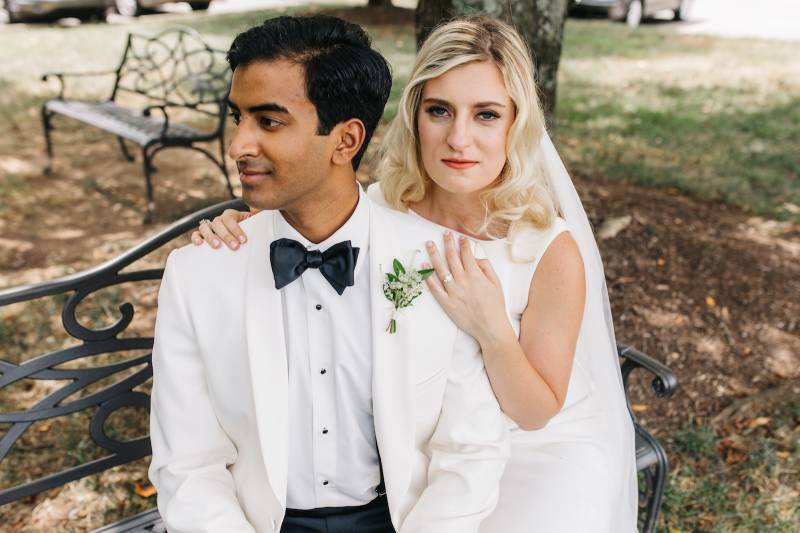 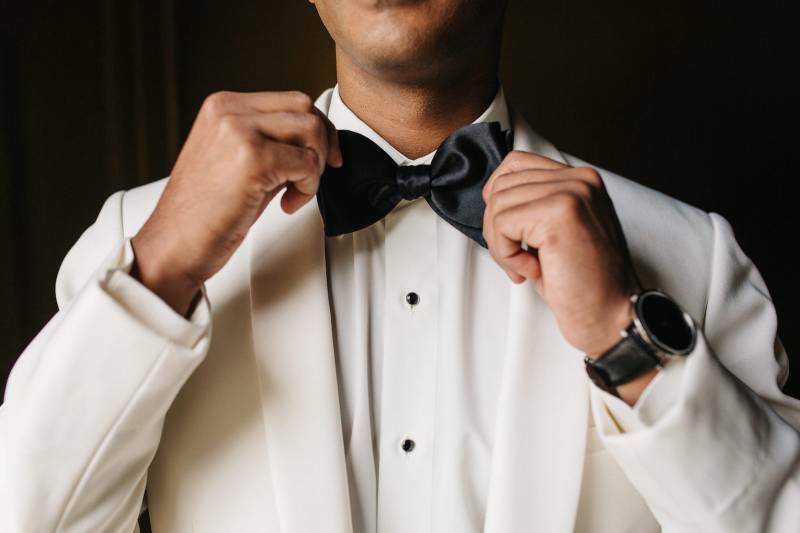 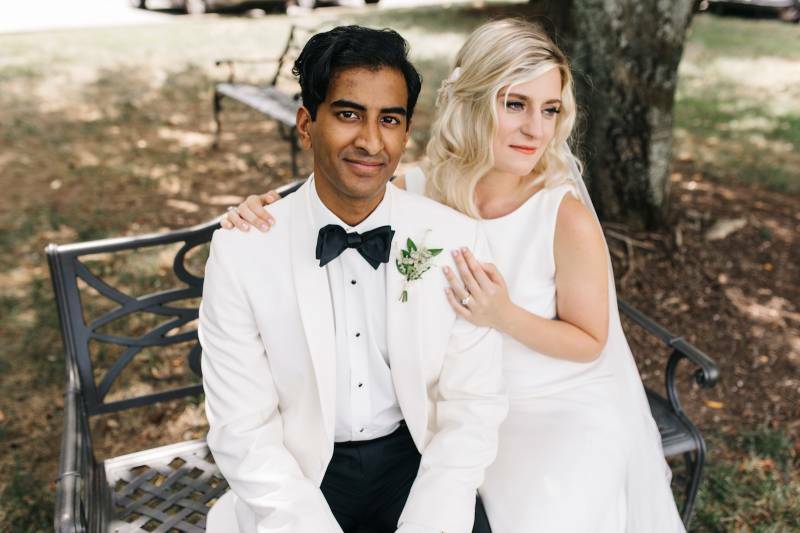 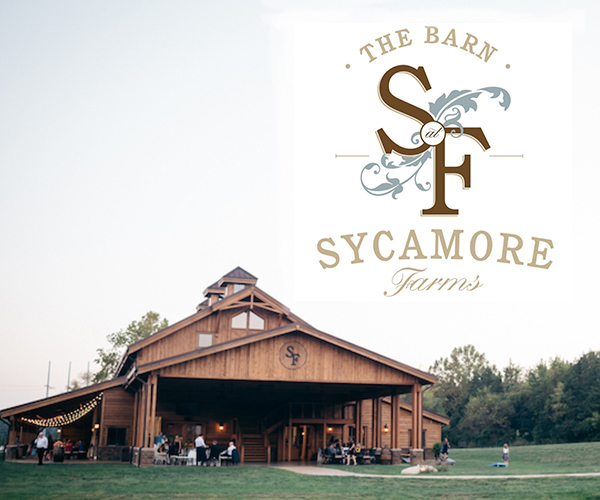 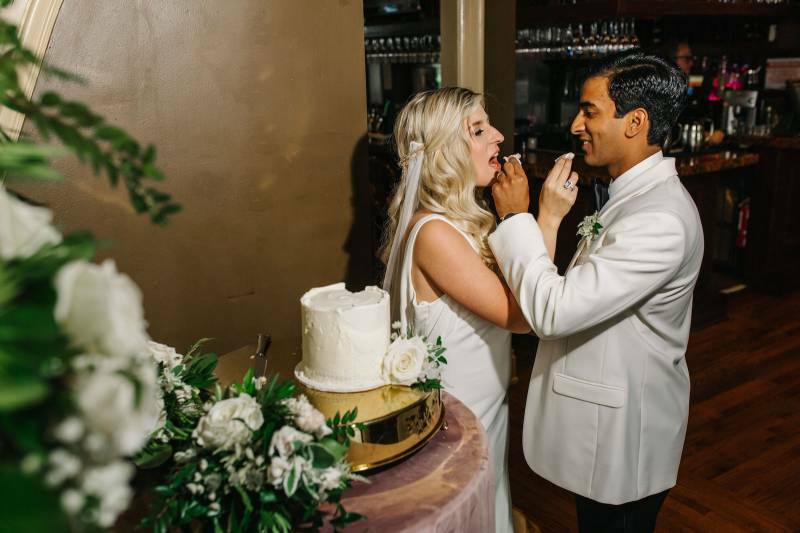 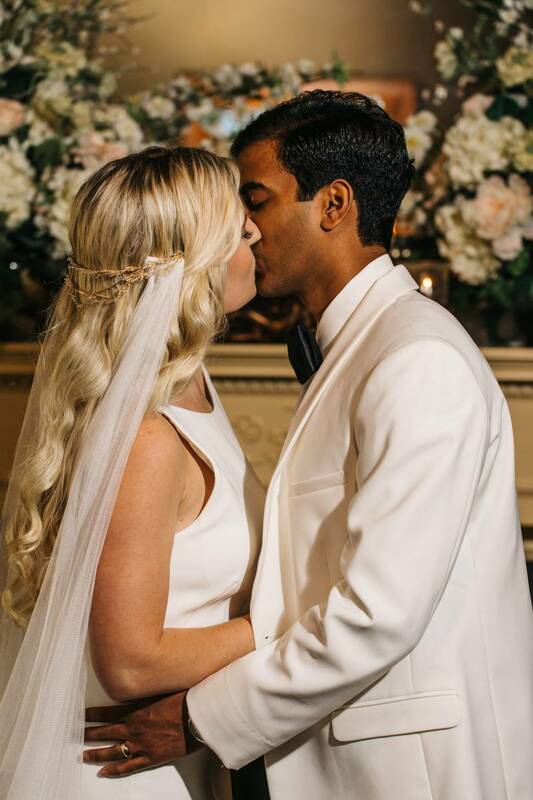 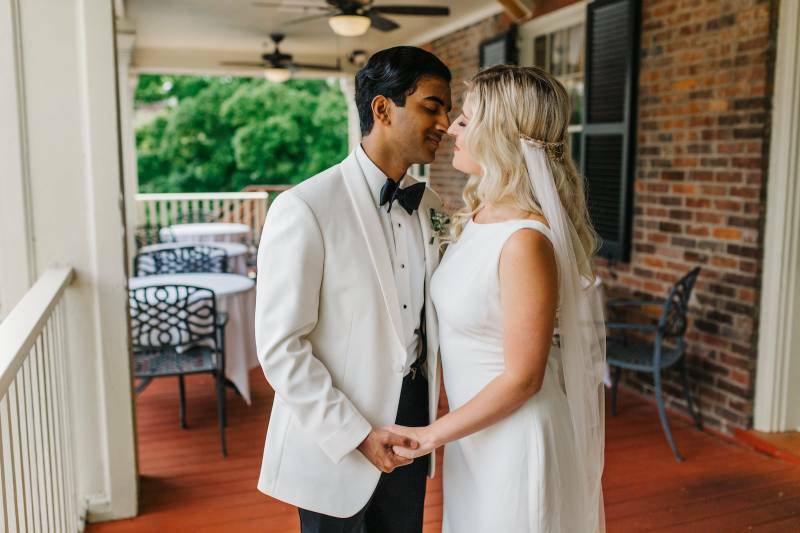 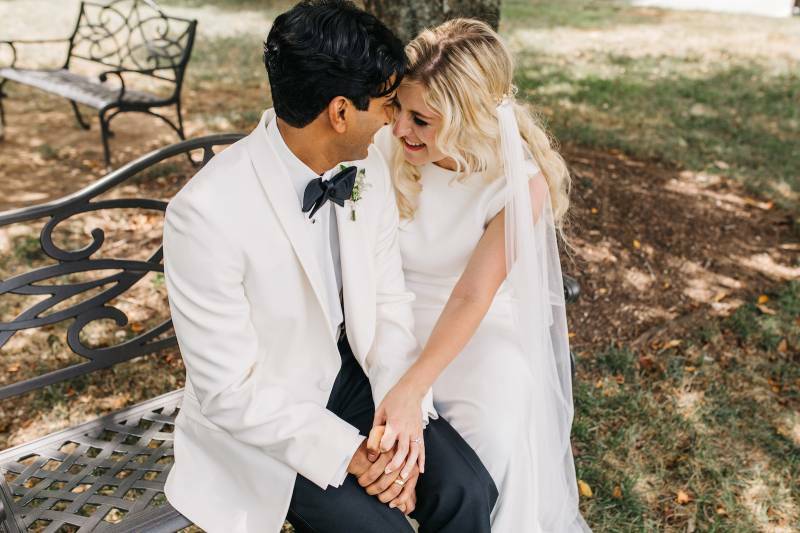 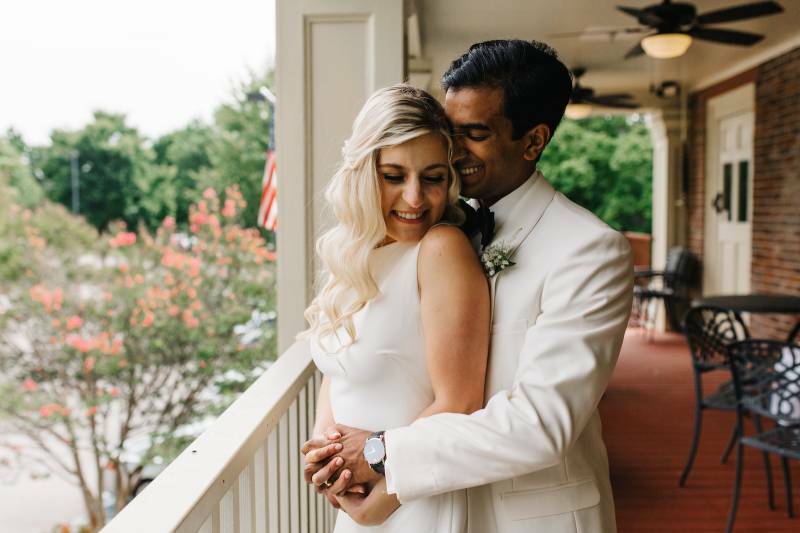 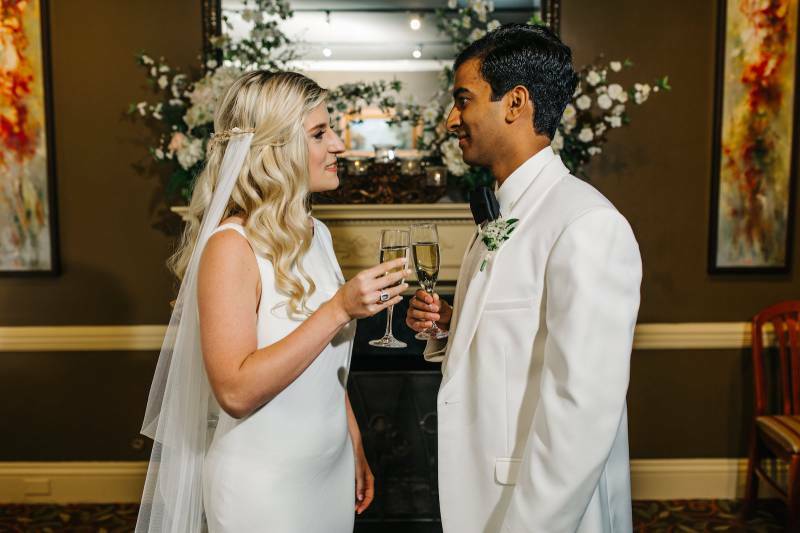 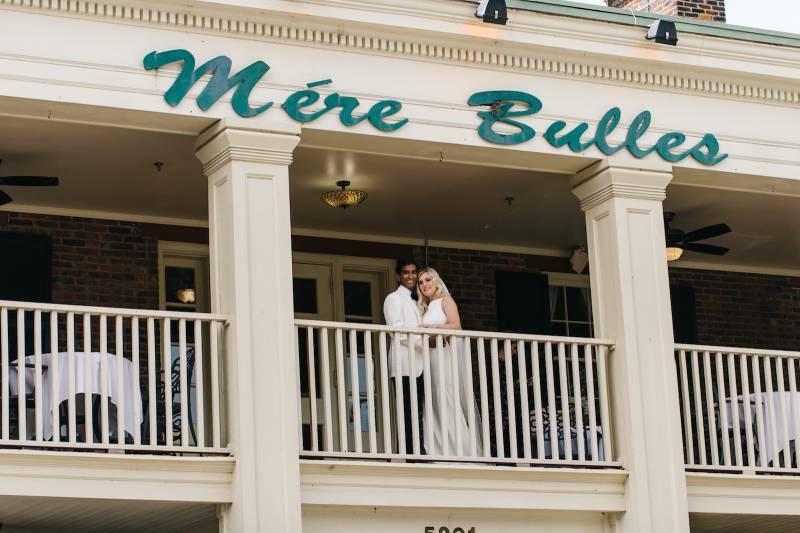 Laura K. Allen was so gracious to lend her lens to the occasion by photographing the day at the classic rehearsal dinner and elopement venue, Mere Bulles. 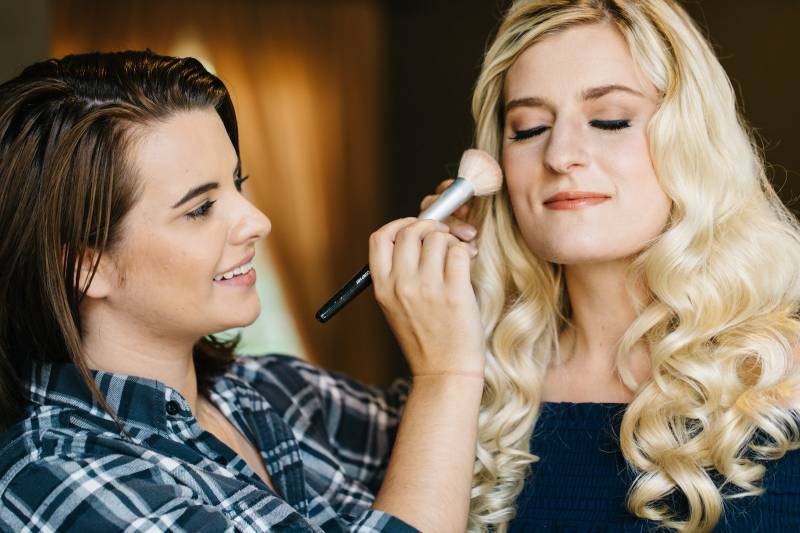 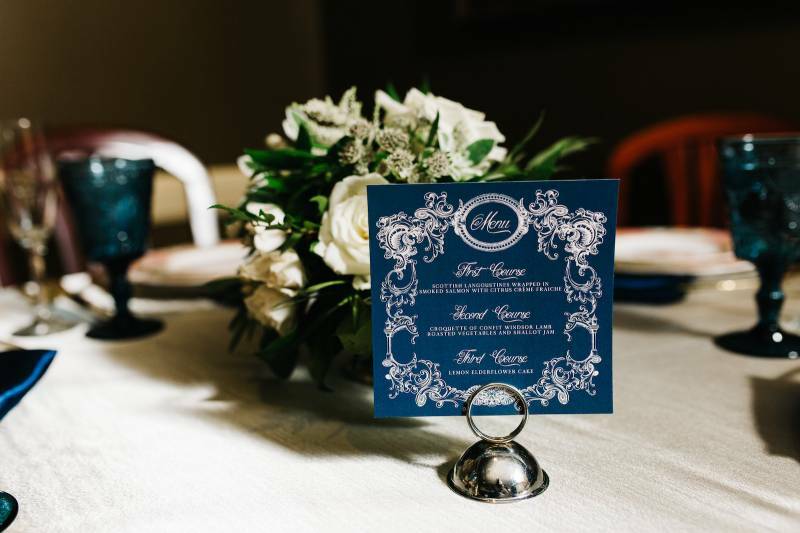 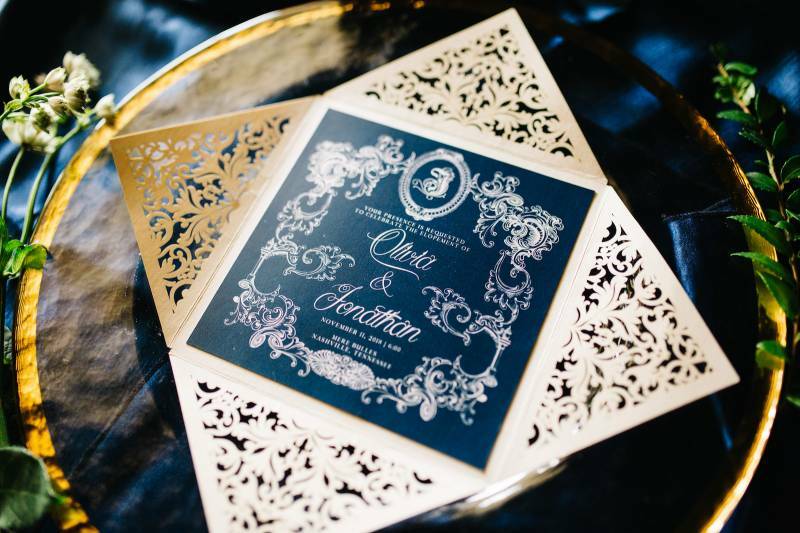 Randi with Jet Set Planning was so on point with her planning and design eye with this shoot - she really helped pull the day together with so many details! 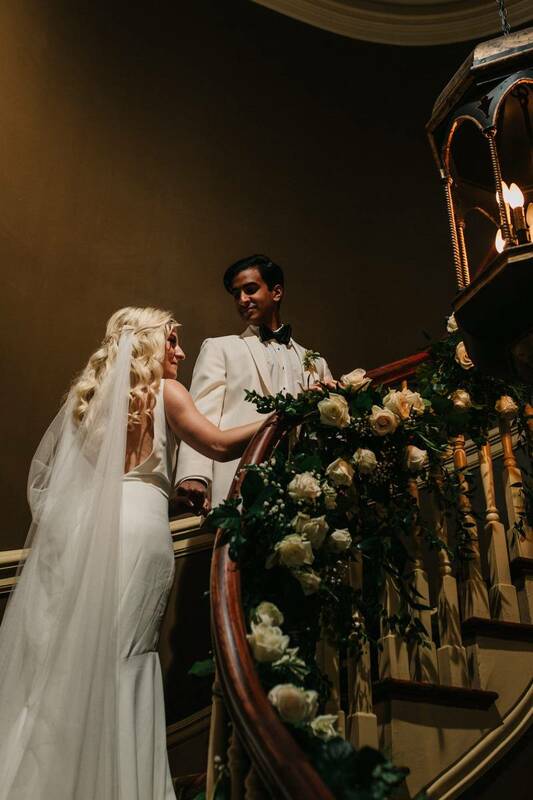 From the simplistic wedding gown to the elaborate floral staircase, we present to you.. the Royal Wedding Elopement! 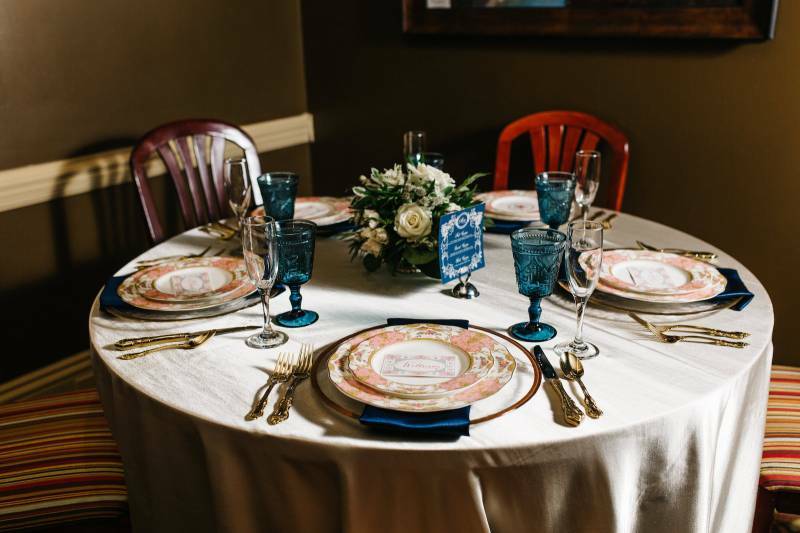 We started the day off by styling a rehearsal dinner scene. 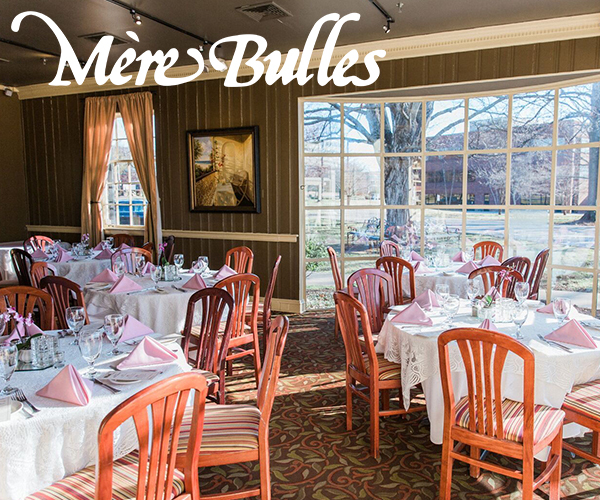 Since our venue Mere Bulles is known as one of the best places to host a rehearsal dinner in Nashville, we wanted to show off their space for that purpose. 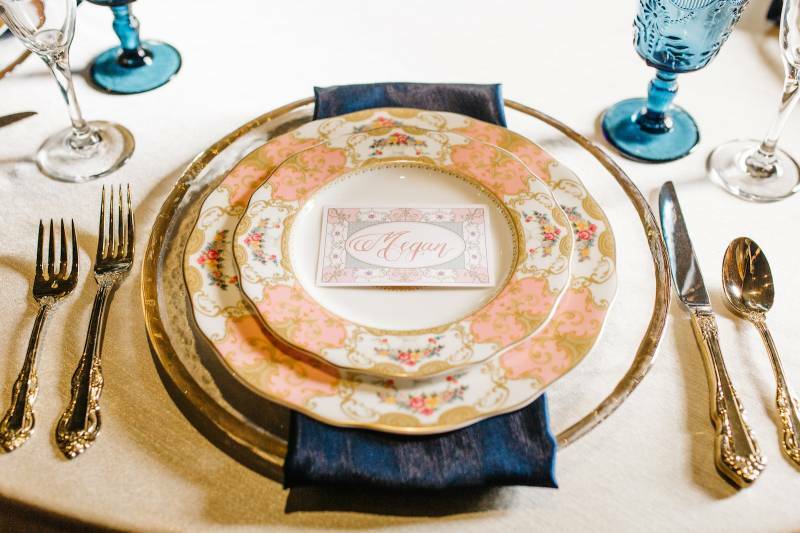 Our models dressed in our blush and navy theme and their excitement showed in the photos! 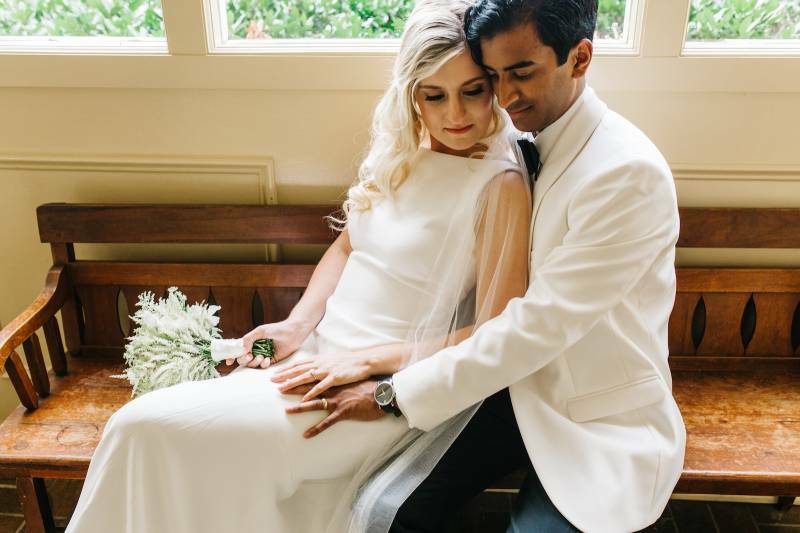 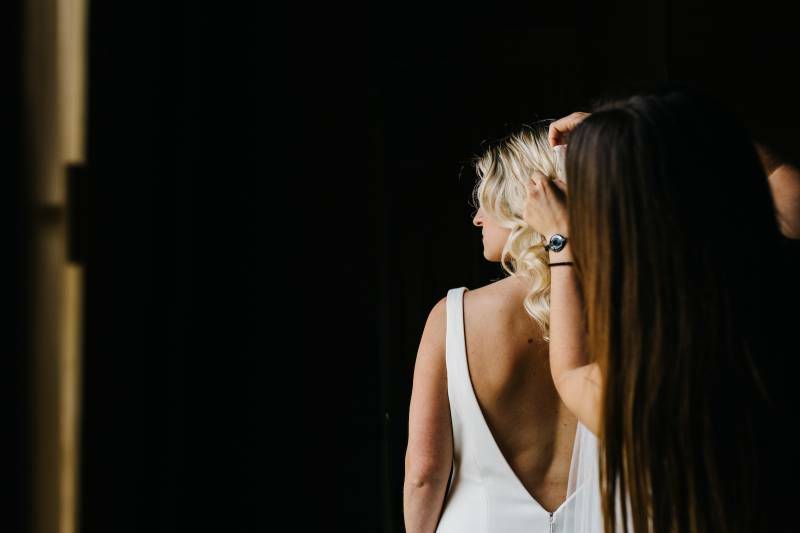 Each gorgeous bridal element was perfect for the styled shoot. 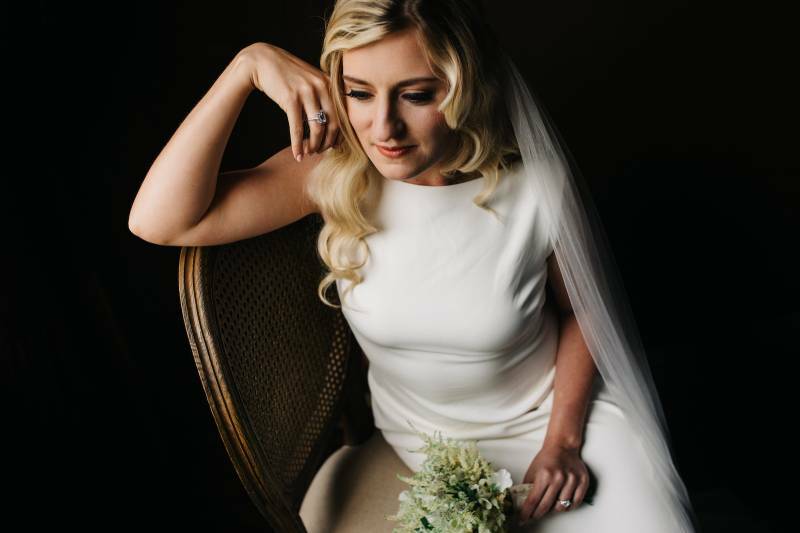 The Theia dress was loaned to us by Fabulous Frocks and gave the simple chic look similar to Meghan Markle's dress for the royal wedding. 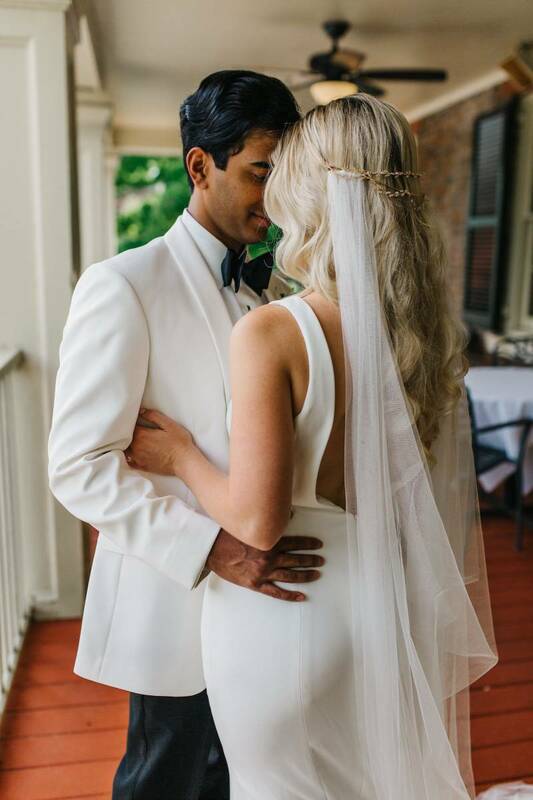 Alice & Mae loaned us a beautiful handmade veil. 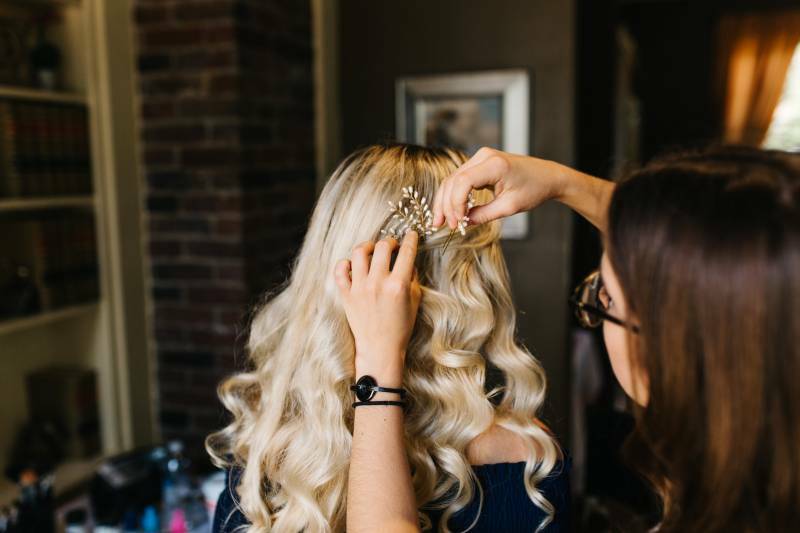 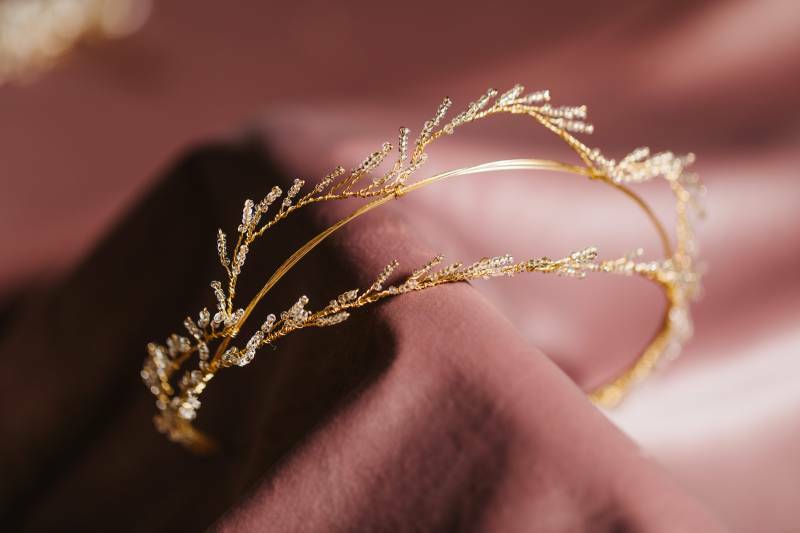 We incorporated their gold crown in an untraditional manner - Claire Mints Makeup Artistry pinned it upside down to the back of the veil to create a more modern take on the royal wedding. 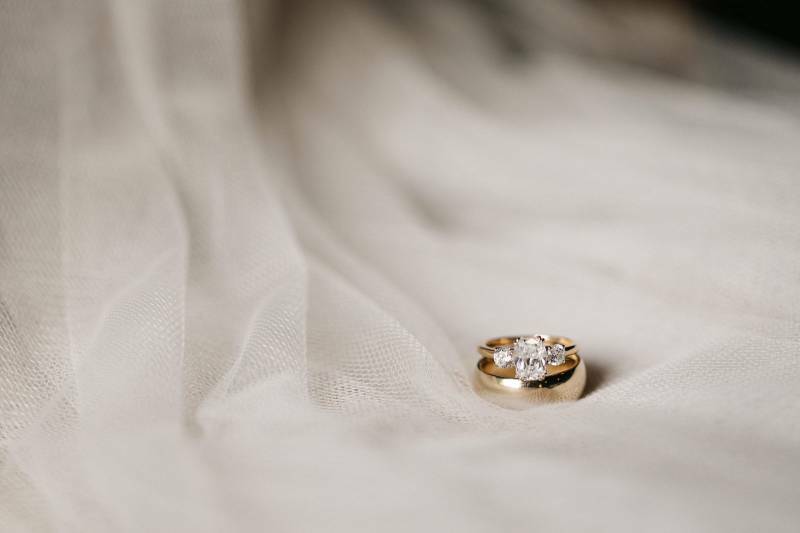 American Jewelry Co. contributed three stunning rings to the shoot including one blue statement gem that gave a nod to the crown jewels. 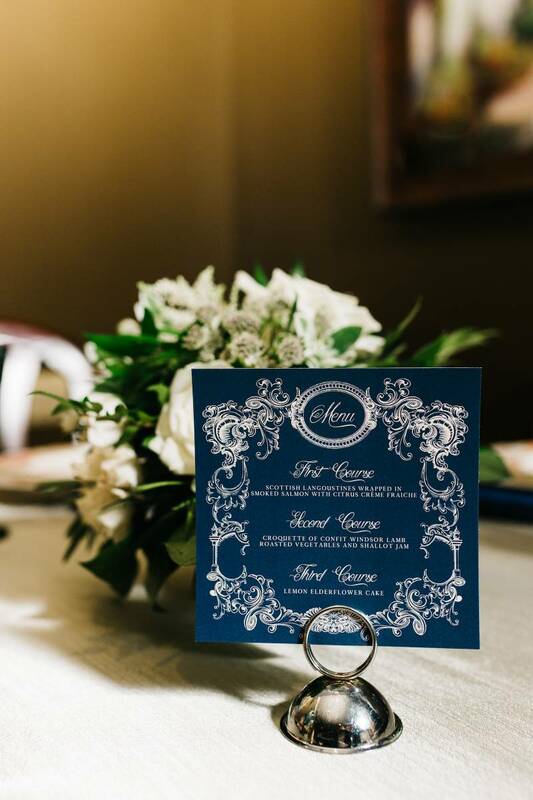 Fanciful Ink designed and printed some custom menus, place cards and invitations (complete with a gorgeous ornate laser cut!). 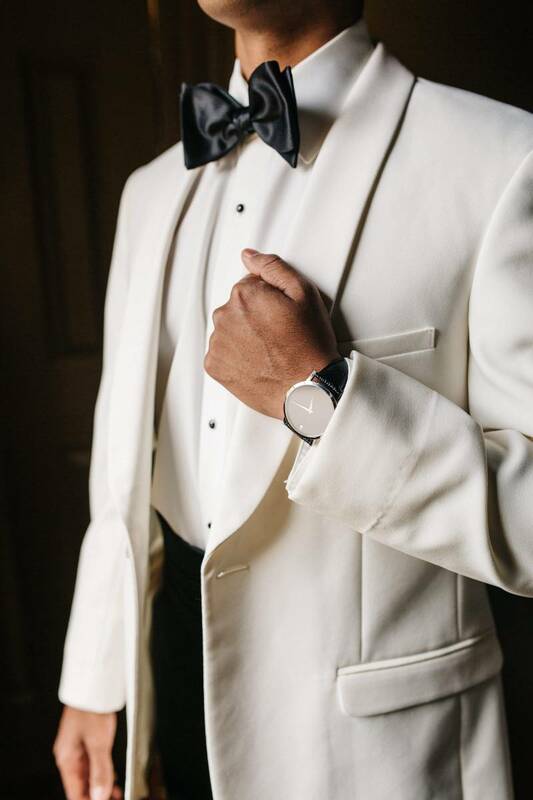 Plus, Jonathan's tux from Street Tuxedo was dapper as all get out and really tied the whole theme together. 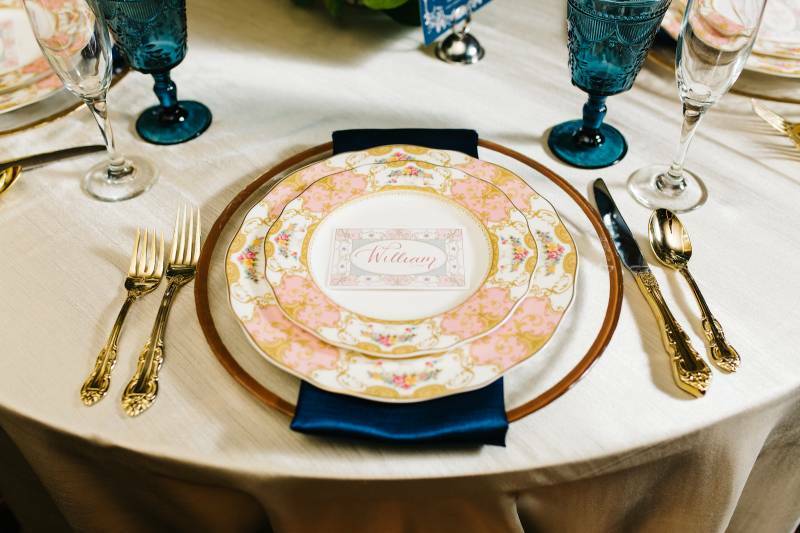 Our navy, blush and cream theme was tied in so well with the rentals from Liberty Party Rental. 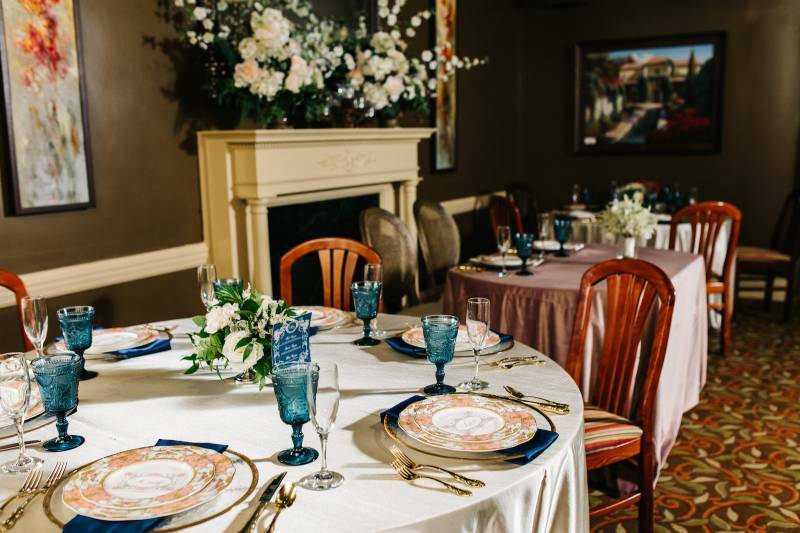 We rented their new velvet linen and Louis chairs for the head table for a rich look. 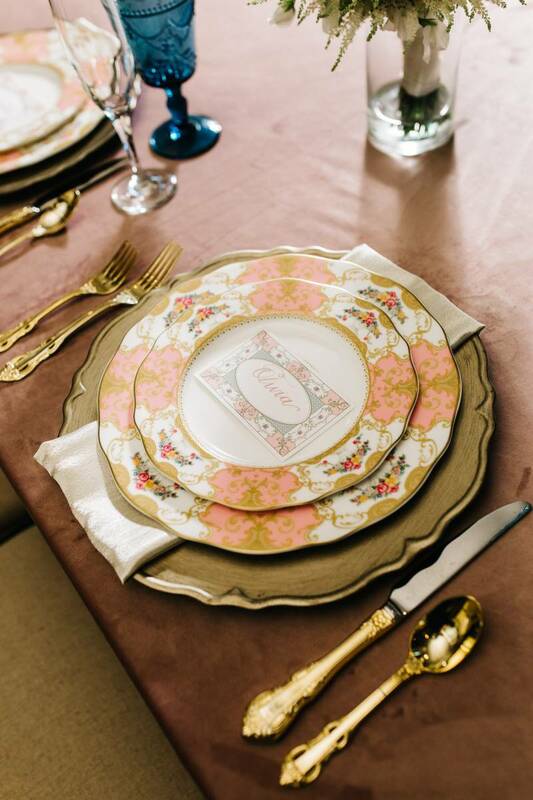 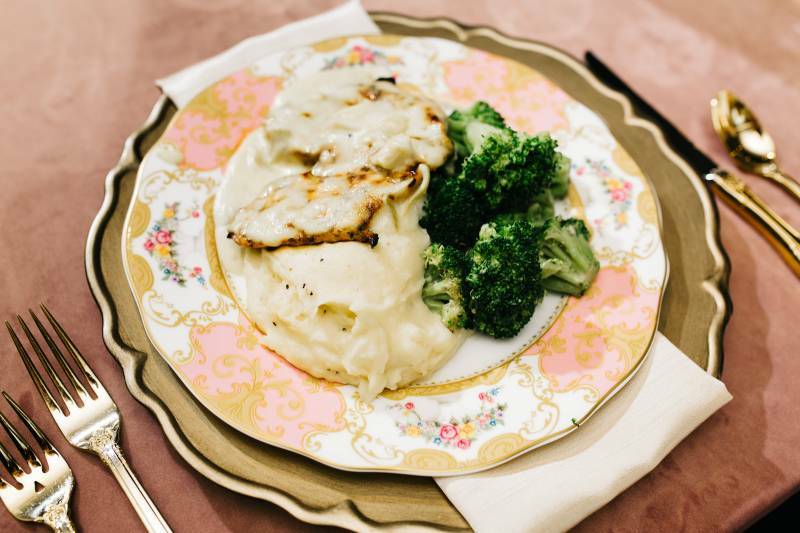 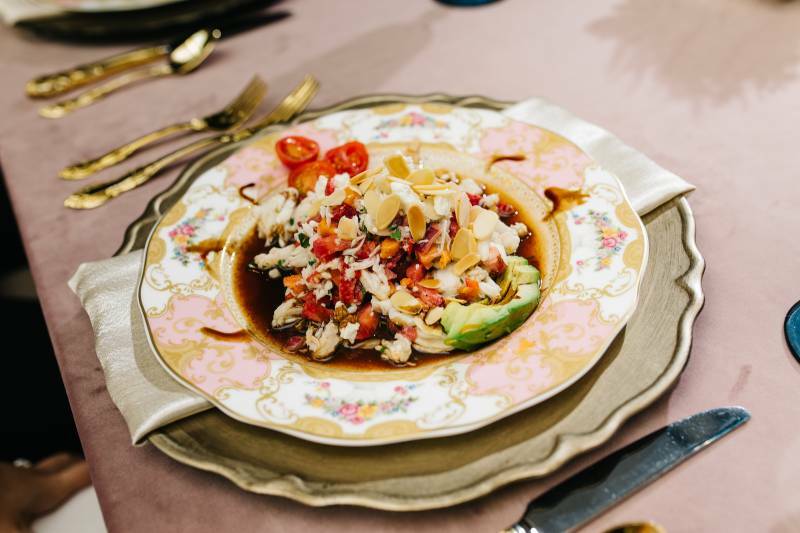 Their Annette Rose China tied in the vintage meets modern theme so incredibly well with the gold ornate flatware... goodness! 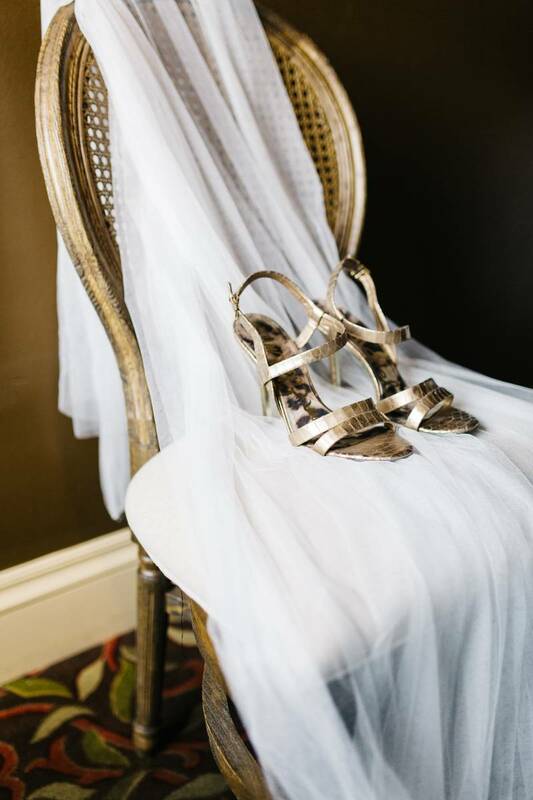 Each detail was a dream for the elegant vintage loving heart of mine! 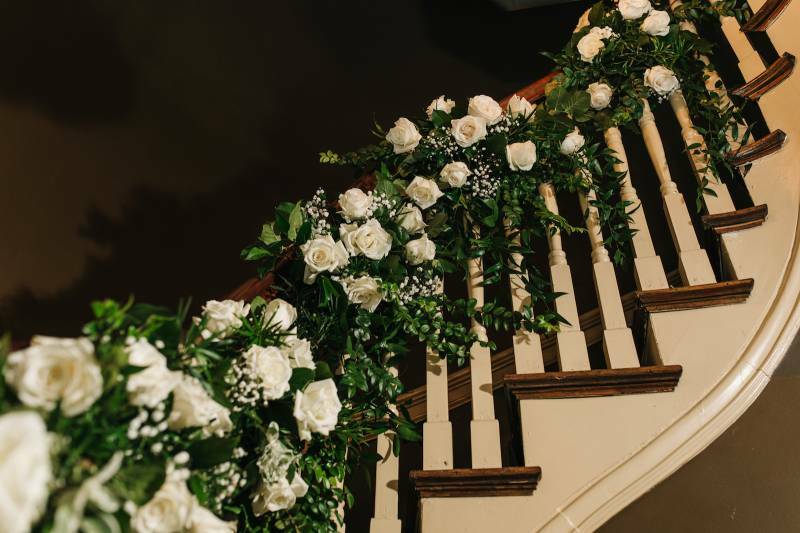 I must say, Melissa Marie Floral Design's floral staircase installation was the real showstopper of the day! 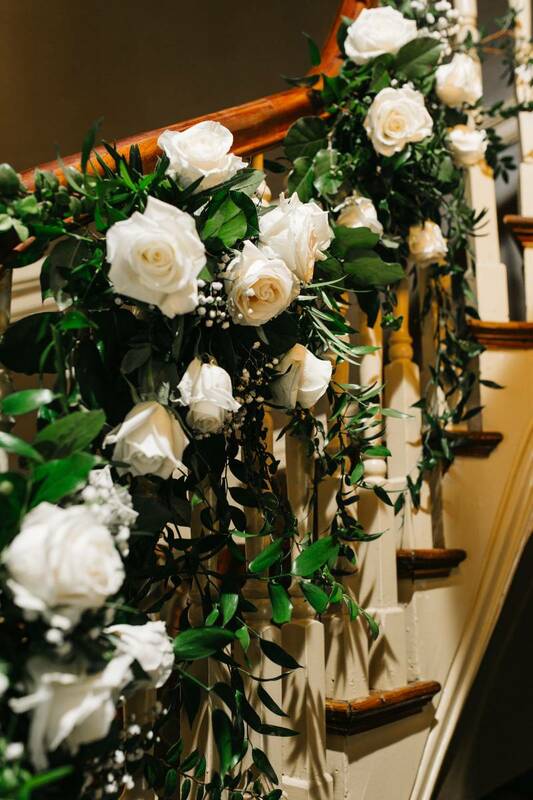 Traditional flowers (that were designated species of florals that the royal family uses) trailed up the grand staircase at Mere Bulles so beautifully - it literally took my breath away! 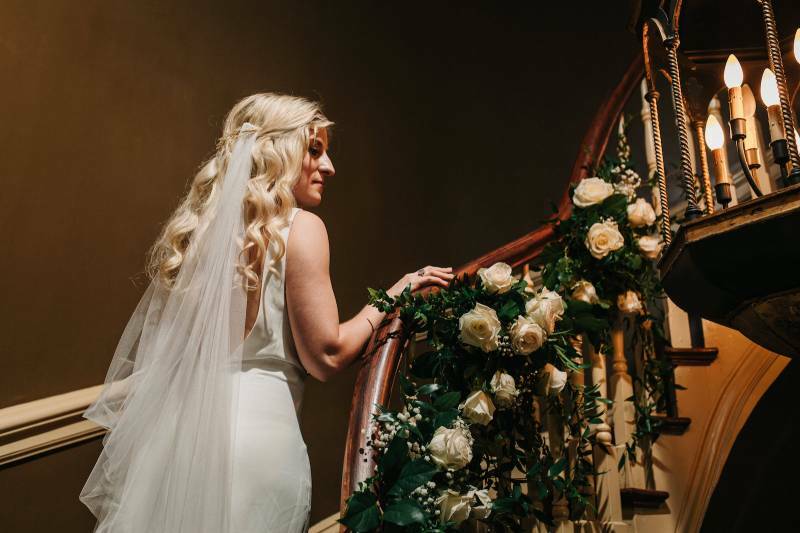 The thought behind everything Melissa did on that day was so meaningful and inspired! 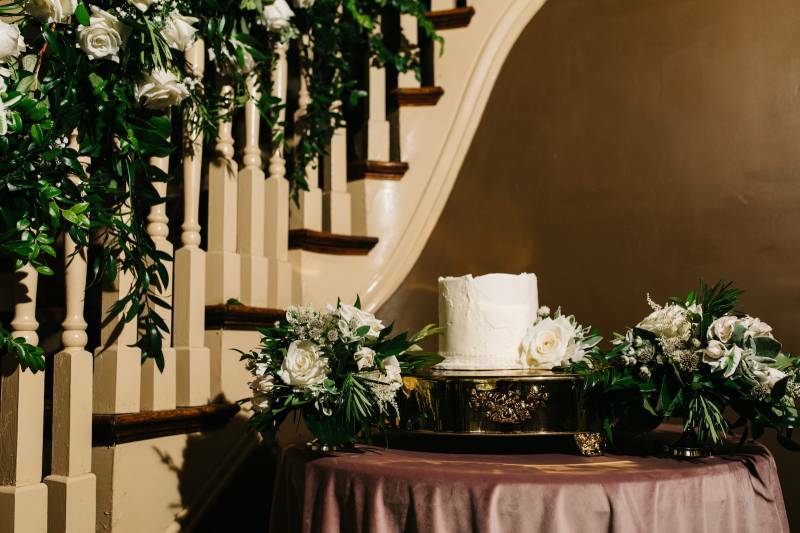 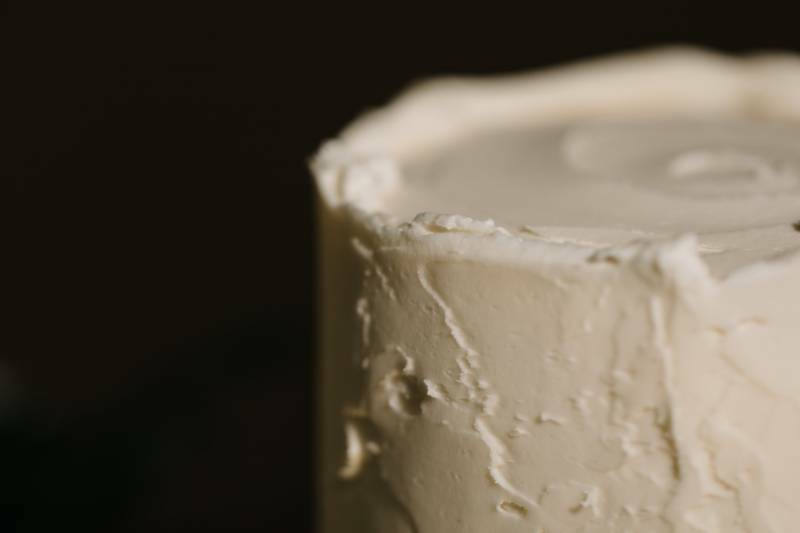 The simple and textured look of the cake by Wolfe Gourmet Cakes really exemplified the royal wedding cake with a gold cake stand and white blooms surrounding it. 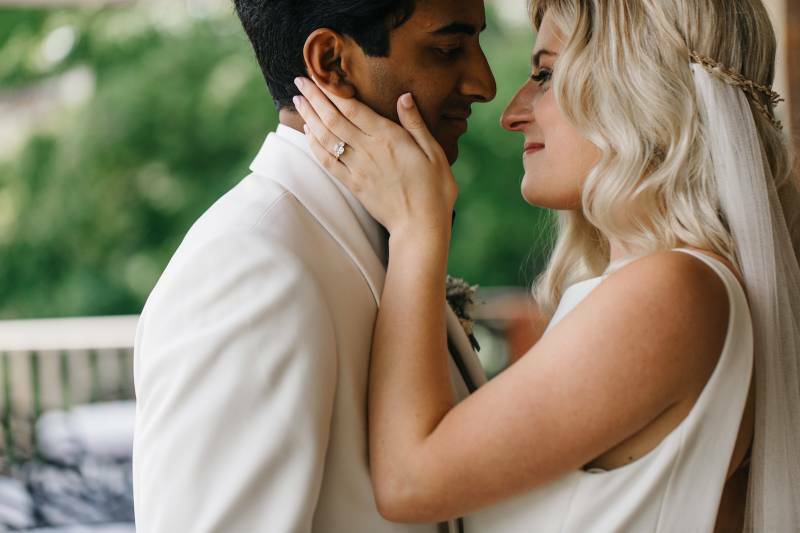 Our sweet REAL couple Olivia + Jonathan were so adorable on set - you could see their love for each other in all of the photos! 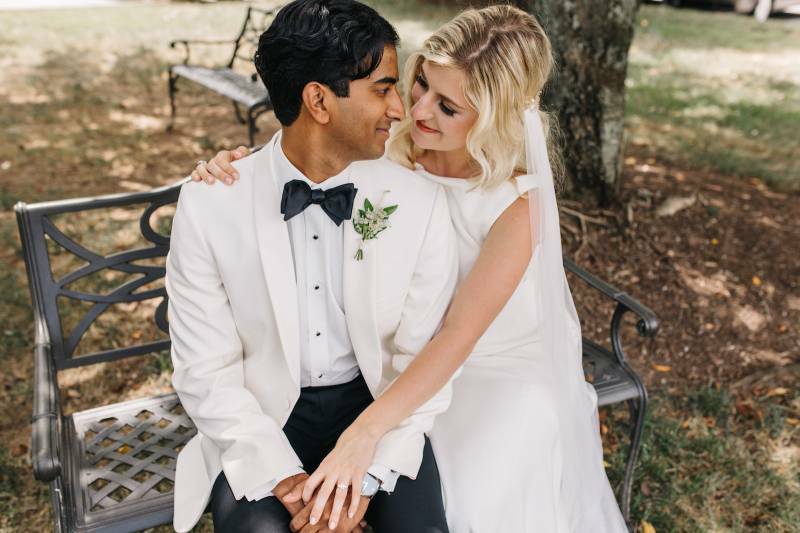 Having them really get in the moment and forget the cameras were there was something so magical - it's like we were all seeing their love story grow so much that day! 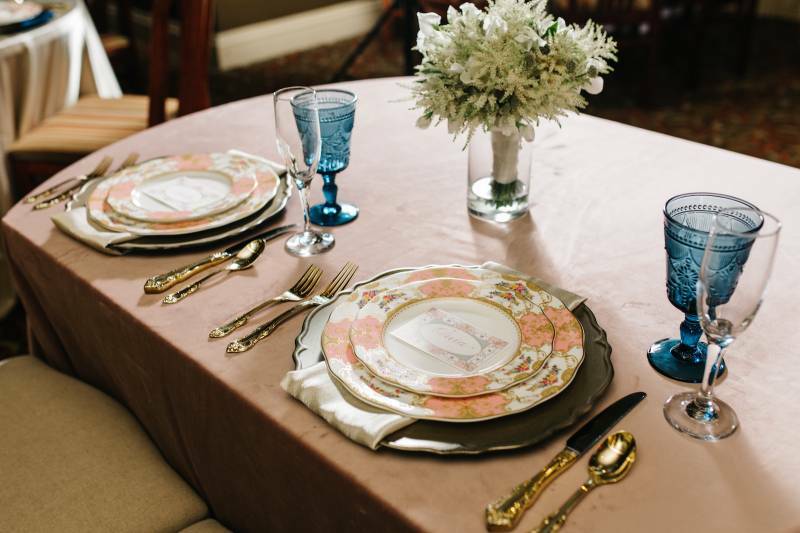 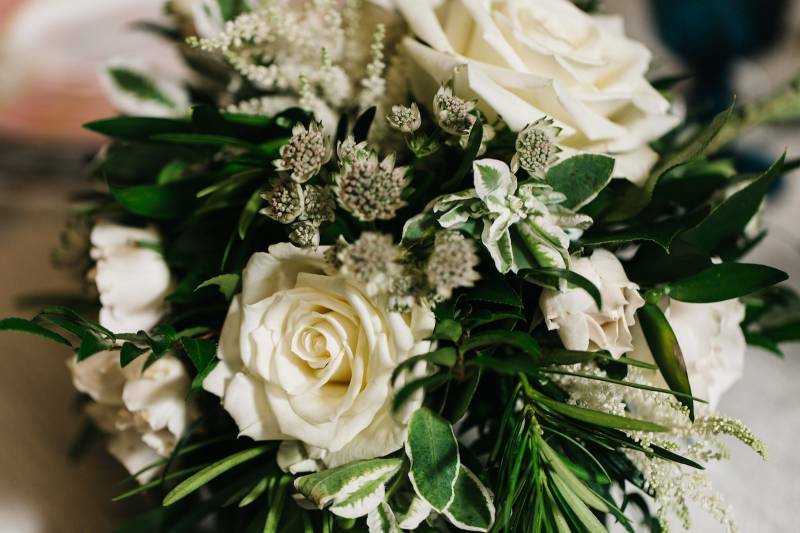 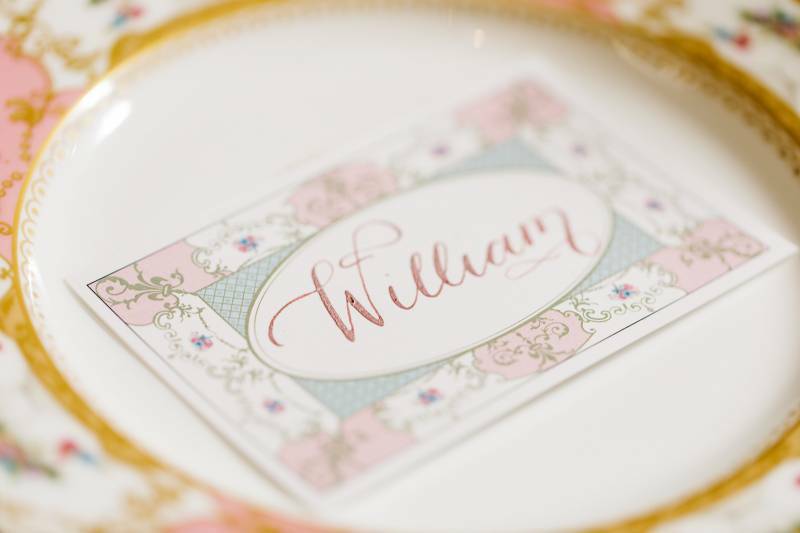 Thank you so much to all of the vendors involved in this royal wedding elopement styled shoot! 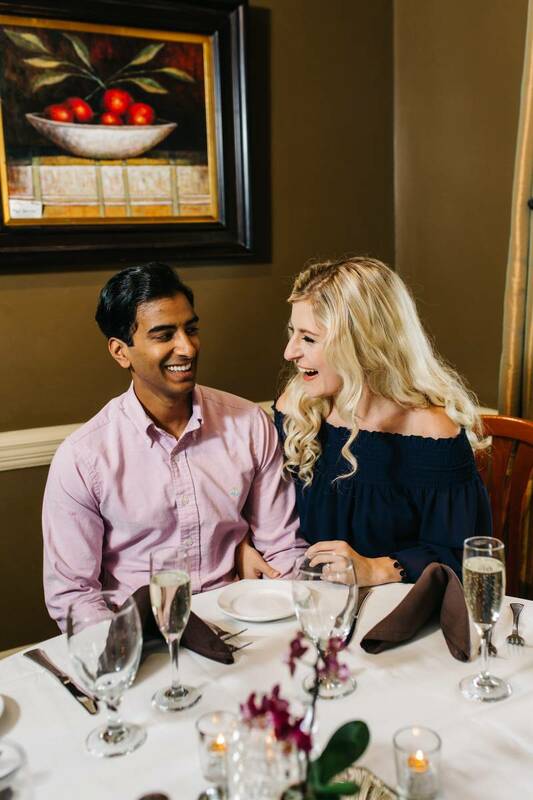 We couldn't have pulled it off without you! 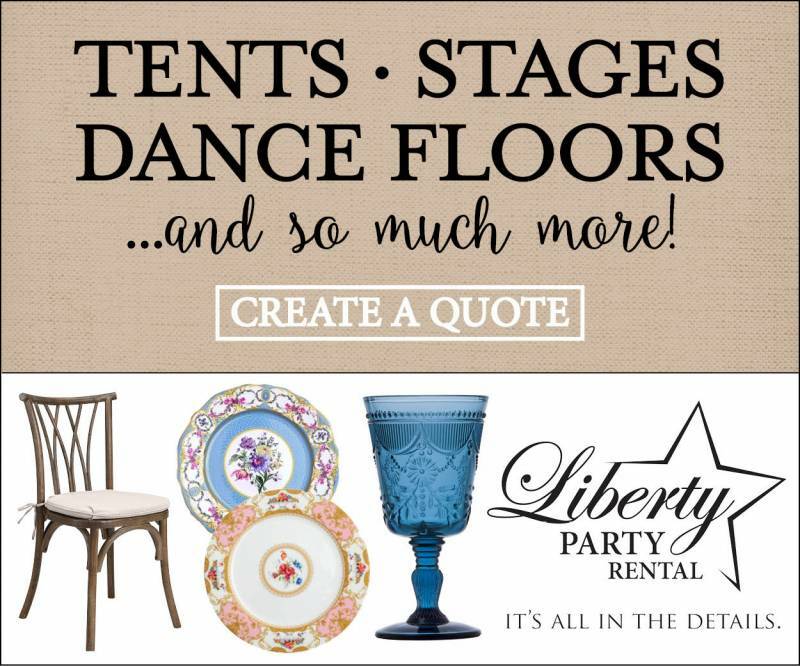 You can check out more on those involved in the Vendors section of the site!